It’s taken me two weeks into the new year to accept that yes, it’s really “6” that I have to write at the end of the date and to switch out all the wall calendars. And to write a new post. People, I think I’m in a funk. Where did my carefree days go? Is this a side-effect of having an actual audience? The more I think about it (and this post is mostly me thinking out loud, I’ll warn you now), I think I'm “stuck” because I’ve come to expect my posts to be really long and thorough. That kind of expectation creates an overwhelming hurdle for me every time I have an idea. But that's my own fault; I do tend to get obsessive about details and take a completist's approach to things. Dissatisfaction with my own writing doesn't help either (“if I just write longer, maybe I can express what I’m thinking!”). But I also know that the longer I wait (for what? who knows?) in between posts, the harder it’ll be for me to produce. The increasing backlog of drafts in my head will get less exciting and more irrelevant the longer I let them stew. That’s no fun! So yeah, I’m thinking, it’s time for me to experiment with shorter posts, maybe in more conversational style. One of the goals of this space is to document and share my thoughts and opinions as they happen anyway, not to be perfect or complete. And I have a lot to say! Also, mylife is about to get really hectic, which means I won't be able to write massive posts with any regularity for awhile. If I try to maintain the same old approach, I’ll probably write even less, stress myself out, and then before you know it, this site will be dead! I don’t want that to happen; I really love this little corner I carved out of the Internet. So something will have to change. But I’m still setting lofty goals for myself, so I can write a year-in-review post next year and lament how much I didn’t accomplish. Per aspera ad astra. 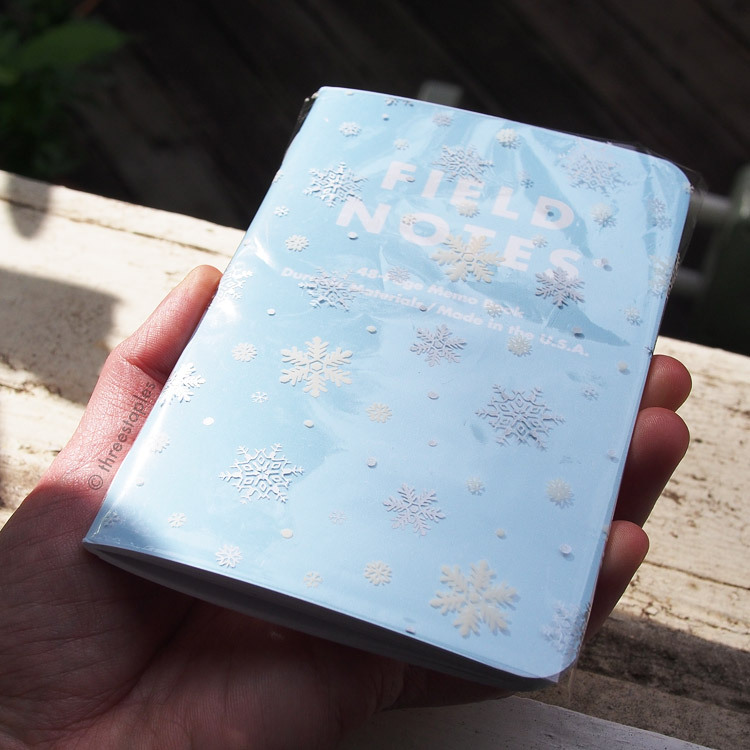 Seriously, like I mentioned, I want to continue Extra Staples, and do more Field Notes color comparisons. I only did a few last year, and those are always fun to do. I want to cover special editions, in addition to all the Colors editions, like the beautiful black-and-white XOXO '15 edition. Photography comes more naturally to me than writing does, so maybe I can make each post more photo-centric... We’ll see. It will always be a work-in-progress. What do YOU think? Do you want me to post more frequently? Have my posts been too long? Too inside baseball? Not detailed enough? In case you were wondering, this is how I masked “2016” on Snowblind. I cut a sheet of clear film to size and transferred “2016” on it, using the Dry Transfer kit. That was all there was to the preparation. The execution took some time and patience but the end result, however temporary, was worth it!